Construction of our M.G. Locost continues in the form of cutting up metal tubes and buying parts. During the past month we've managed to find a lot of really good stuff on eBay. Or not that good, but maybe useable. If we're lucky. We’ve got one MGB suspension upright (a.k.a. 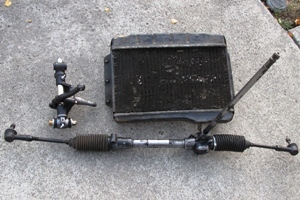 swivel axle) that needs rebuilding, a semi-rust-free steering rack with good boots, a radiator that smells funny but looks like it may hold water, and a dozen or so Triumph suspension bushings of dubious origin. Not exactly like having an actual donor, but almost. Okay, not really. 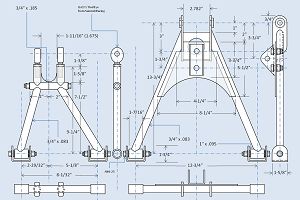 We think it's important to have a donor before you build your Locost frame, if only to improve your odds that everything will fit. Of course sometimes it just doesn't work out that way and you have to move on. The thing is, the market isn't exactly flooded with used MGBs right now. It might've been easier to go with a more popular donor, like a Miata, but then it would've been difficult to call our car an M.G. Locost. Which we really want to do, especially since we spent all that time drawing the logo for our website. We'll keep checking on Craigslist, and let you know if we find anything. In addition to our meager collection of M.G. 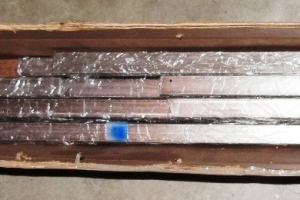 parts, we now have about a hundred feet of 1” square steel tubing cut up into tiny little frame parts, all labeled and wrapped up in plastic. So we're making progress, although you can't really tell by looking at it, which is a little discouraging so we thought maybe a change of scenery was in order. 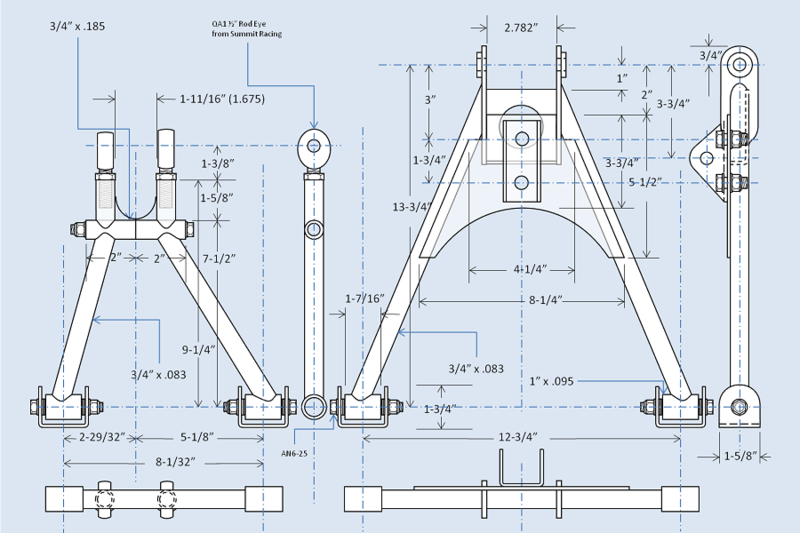 We've been working on the front suspension design for quite a while now, and we think maybe it's time to start building it. So we ordered some round tubing for the A-arms, and are eagerly awaiting their arrival. The front A-arms will be a little different from those in the Locost book. The upper A-arms will actually be two pieces, bolted together near the swivel axle attachment, just like in a real MGB. This arrangement allows the axle to be installed and removed without the usual destruction of the upper bushing. The upper A-arms will also be adjustable for length, in case we want to adjust the camber, assuming we're anywhere close to the correct camber when we're done building the suspension. The only reason we're concerned is that we're not using the latest 3D design tools. Or any 3D design tools. We're sketching everything out in PowerPoint. We realize that sounds weak, but actually, PowerPoint is way more accurate than our previous design tool, Microsoft Paint. It may also be better than the tools used to design the very first Lotus 7, which legend has it was chalk on a garage floor. So far as we know, that's the only time anything like that has ever been done, unless you count the time MacGyver built a makeshift hang glider out of rope and bamboo. Once all of the A-arm parts are done, we plan to get them TIG welded. We’ll build the jig and cut the tubes, but we’ll take them to a shop to have a real welder do the actual welding. Our own welding skills are limited to a single semester at our local community college, where we did mostly gas welding. We trust our Miller 140 to MIG weld the chassis well enough, but I think we’ll all feel better knowing the A-arms were TIG welded by someone who actually knows what they're doing. With the A-arms welded up, we’ll be a little more confident we can get this thing completed someday. We might've mentioned this already, but a project of this magnitude can be a little intimidating, especially when you've never done anything like it before, which coincidentally is exactly where we find ourselves now. In any case it's hard to gauge this early on how long the whole thing is going to take, and we think it's best for now not to know. Maybe sometime down the road. I like viewing your site for ideas and giving ideas. There is always sotinhemg to learn and ideas to share. This is your passion / hobby and not your career. As is for most of us a hobby / passion not a career. When a hobby starts paying the bills it is then a career! And without your career to pay for your passion / hobby this site and your guidance would not be. So it is a very nice site for a hobbyist. We are several volunteers and opening a whole new scheme inside our community. Your site offered us with useful information to operate on. You might have done any formidable job and the entire area will be pleased to you. We are several grouped volunteers in addition to opening a brand new scheme in the community. Your website offered us all with beneficial information to the office on. You will have done a formidable job and our entire group will be head over heels to you. I precisely desired to thanks a lot yet again. I'm not <a href=<a><b>pop over to this web-site</b></a> certain what I probably will have completed in the absence of the actual areas provided by you over this <a href=<a><b>More Bonuses</b></a> theme. The idea seemed to be a genuine frustrating issue in my circumstances, but spending time with a <a href=<a><b>click here for info</b></a> specialist style you actually treated it was a little while until me to help weep more than happiness. We are <a href=<a><b>anonymous</b></a> happy on your service and after that trust you undoubtedly know what a fantastic job you happen to be always doing teaching consumers using a <a href=<a><b>my response</b></a> blog site. Most probably you may have never met all of us.